That praise reflects Palmer’s immense skill in building a world 500 years in the future but also her vast knowledge of the past. And it’s no surprise that Palmer knows something about the past. In addition to launching the first of a four-volume series with Tor, she is a cultural and intellectual historian at the University of Chicago, where she studies (among other things) the history of publishing and the Italian Renaissance. She says that knowing exactly how the world has changed over the last 500 years – politically, culturally, socially – has helped her imagine plausible changes for the next 500. In Too Like the Lightning, the 25th century is enjoying a reinterpretation of the 18th century Enlightenment, although with flying cars and non-geographic nations. Society congratulates itself for having banished organized religion and gender distinctions (Palmer writes much of the book using the singular “they”) but, as in so many cultures, people are blind to their own shortcomings. Before she put pen to paper, Palmer spent five years planning the world of Too Like the Lightning, including forecasting the future history that shaped it. And it took another eight years for the book to be published. But critics and readers agree that it was worth the wait. 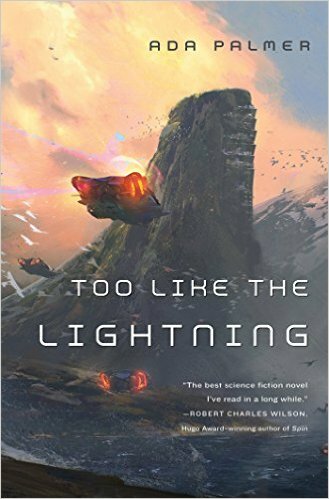 The second installment in the Terra Ignota series, Seven Surrenders, was originally slated for publication in December but Tor has pushed back the release to February to make room for a paperback version of Too Like the Lightning first.